​The Arms of the King of An Tir. ​​The Arms of the Queen of An Tir. Livery colors for An Tir are Or (gold/yellow) and Argent (silver/white), Sable (black) can be used as an accent. Any member of the populace may display the Populace Badges to show their An Tir loyalty and pride. The Lions head should always be displayed so it is facing to the viewer's right. An Tir is a Kingdom in the Society for Creative Anachronism (SCA), a non-profit educational society dedicated to the recreation of the Middle Ages and Renaissance.​ The Kingdom boundaries include Oregon, Washington, the northern tip of Idaho, British Columbia, the Yukon, and the Northwest territories. The Kingdom of An Tir contains two principalities: The Summits and Tir Righ. An Tir proper consists of Washington State (except the northwest edge tip), Northern Oregon and Western Idaho. The Summits boundaries are Southern Oregon. 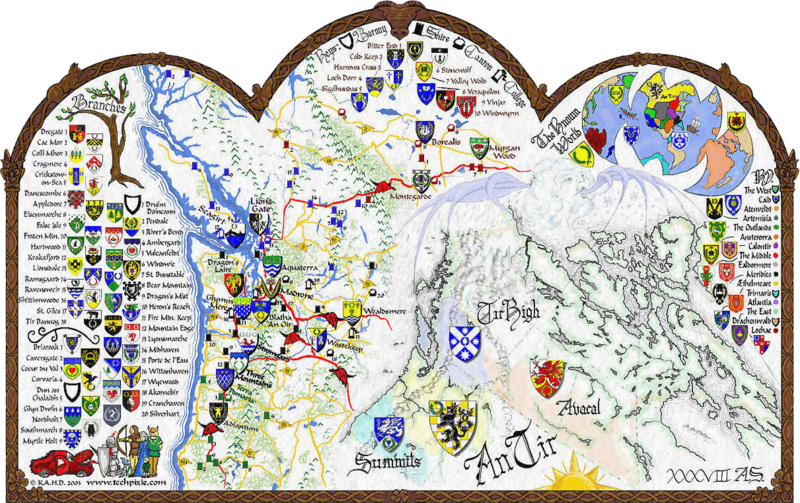 Twenty Kingdoms make up the known world of the SCA: Æthelmearc, An Tir, Ansteorra, Artemisia, Atenveldt, Atlantia, Avacal, Caid, Calontir, Drachenwald, Ealdormere, East, Gleann Abhann, Lochac, Meridies, Middle, Northshield, Outlands, Trimaris, & West.